Boil hot dogs until hot, cool. Preheat oven to 375*. Butter your muffin pans or use paper muffin cup liners. Mix dry ingredients separate from wet ingredients, then combine until mixed. Use this size ball scooper if you have it (much easier), or just drop 1 Tablespoon of batter into each mini-muffin cup. Use 3 Tablespoons of batter in the regular muffin cups if you're using those. 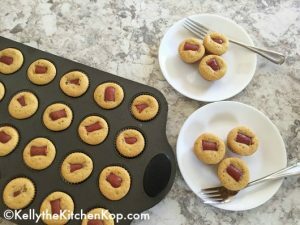 Cut hotdogs into 1" pieces, put one into each mini muffin cup or 2 pieces into the regular muffin cups. If you have extra, you can put extra pieces into some. Bake 8-12 minutes or until golden. Cool before serving or they won't come out nicely. Kids like to dip these into (organic) ketchup, of course, but we like to dip them into mustard.